The presentations at this event were top-class and I brought home a list of great ideas from the speakers. But I also learned some greath things in-between the presentations, from the people I met in person. Trimming a bloated strategy map. Louise Watson, of Adura Strategy in Vancouver, is one of the most positive people I’ve met. I mean positive in the sense that she sees opportunity no matter what the situation. I listened as Louise gave some very practical advice to a participant whose company had a strategy map that had more ‘bubbles’ than a bottle of champagne. Rather than criticising how many strategic objectives there were, Louise immediately described a collaborative process to simplify the bloated strategy map: using post-it notes to collapse duplicate objectives together, and to separate those that should really be rephrased as initiatives. Planning to make sure change sticks. Peter Ndaa, of Balanced Scorecard Eastern Africa in Nairobi, shared with me, as we were walking and shivering together through the streets of Downtown Atlanta, how he has ‘Sustainability Meetings’ with his clients. These meetings are scheduled over the months after the work is done, to ensure that change is sticking and clients are getting the value they wanted from the change. Process thinking when you don’t know the cause. This is so true! Often we know what the problem is, but we’re just don’t attack it directly. We don’t need an elaborate improvement project to fix the obvious. But when the causes aren’t obvious, Scott made it very clear just how important it is that we understand our business processes. Moreover, he advocates that “process mapping is a team sport”. It so is! The tried and true still works. These methods work. That’s why they’re still used. 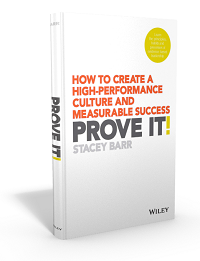 We don’t need to have the ‘latest and greatest’ in our pursuit of performance excellence. We need to master the basics first. What are your favourite ‘tried and true’ basic method for strategic performance and change management? Share your suggestions on the blog. Communicate & Connect to Engage, Enable & Empower. Are you going to become a REFORMED Management Consultant? A Results-Oriented Management Consultant?